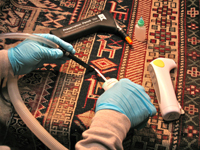 Talisman Oriental Rug Cleaning offers repair and restoration for damage to rugs due to aging, accident or wear. Yarns, colors and techniques are matched - with custom dyeing when necessary. Due to the non-standardized production of modern rugs, we continually find new situations and materials that call for new approaches and unique solutions to restoration. 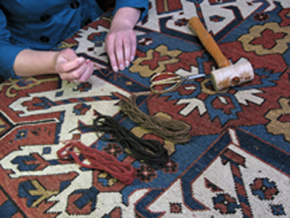 Rug restoration is traditionally a utilitarian craft. However, in Talisman's hands this skill has been elevated both to an art and a science. The repair and restoration of Oriental rugs - both ancient and modern - benefits greatly from Talisman's long experience and unmatched expertise. At Talisman, traditional reweaving and repair techniques have been updated by modern conservation science. Museum standards governing material choice and reversibility are carefully observed. Rugs are prepared for floor use, display or storage utilizing archival materials. 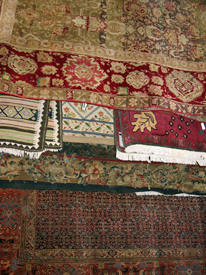 Rugs restored by Talisman are found in collections throughout the world. The essence of cleaning is the minimization of risk - while thoroughly removing all soil. 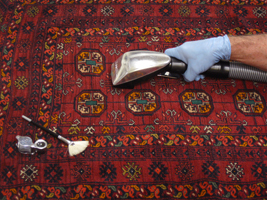 Talisman emphasizes cultural and scientific knowledge, careful analysis and individualized strategies in order to create reliable step-by-step approaches to cleaning Oriental rugs. Talisman does not use washing machines, carpet steam cleaning or machine brushing. All cleaning is done exclusively by hand. Everyone is welcome to tour our studio and to view and discuss our work. Talisman is not limited by a single technique or "special" process. We draw from a full spectrum of techniques based on today's best science. This is necessary in order to address the unique issues encountered in each situation. We often employ the term "conservation" because the aim of cleaning is to enhance, not only the appearance, but also the preservation of the rug and its innate values. Insect eradication, blocking, pads, etc. are also provided. Talisman's restoration and cleaning services are unmatched anywhere. Read about some of our projects on our References page - and phone us with any inquiries concerning the nature of cleaning and repair. 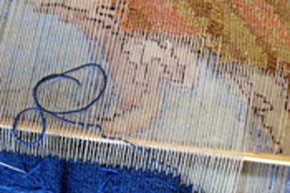 Repairing rugs early, when only a few stitches are needed, is preferable to costly restoration later. Cleaning for most rugs occurs on a 2-3 year cycle. This is especially important for health. Rugs absorb pollutants from the air and soil from walking. This results in cleaner initial surroundings - but contributes to unsanitary conditions as the rug eventually returns harmful soil to the environment. A distinguishing characteristic of Talisman Oriental Rug Cleaning is that it does not use any washing machines, machine brushing or steam cleaning. There are no secret formulas or secret processes. Commercial washing detergents and solutions are not used since these can be harmful to wool and silk (especially with the residues that are normally left by more superficial cleaning). However, we use hundreds of different techniques derived from our experience with museum conservation. Talisman stands above all others in the field of rug cleaning - ask any designer, dealer, museum or rug society for a reference. Talisman picks up and delivers from Marin County through the Peninsula to Monterey County - and from San Francisco through the East Bay to Contra Costa County.